A few weeks ago a friend wrote me on Facebook and asked, "Are you and Dave coming to Israel?" That set plans in motion to meet up with her. But not just me! There are others in our group who know her too! 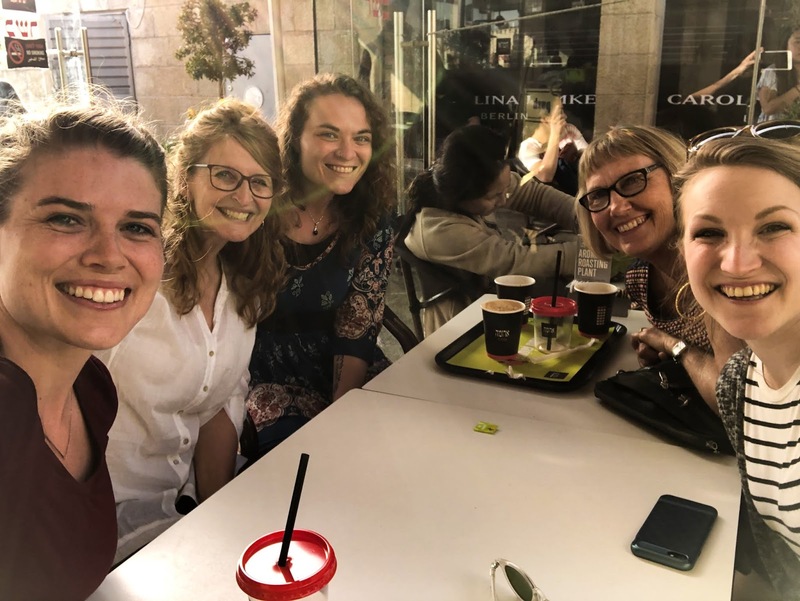 We all go back many years with Katie, who is here studying at Hebrew University, working towards her doctorate in archeology. Theresa, to my right, has known Katie since she was very young. Her dad was the worship pastor at the church Theresa's husband pastored in Warrenville, IL. Heidi, to Claire's left, knew Katie during those church years as well, being just a few years younger than Katie. And Claire and I got to know her during a time when Claire, age 6, was sick and we were in Chicago seeking medical help, with Katie's mom being an encouragement and help to us during that time. 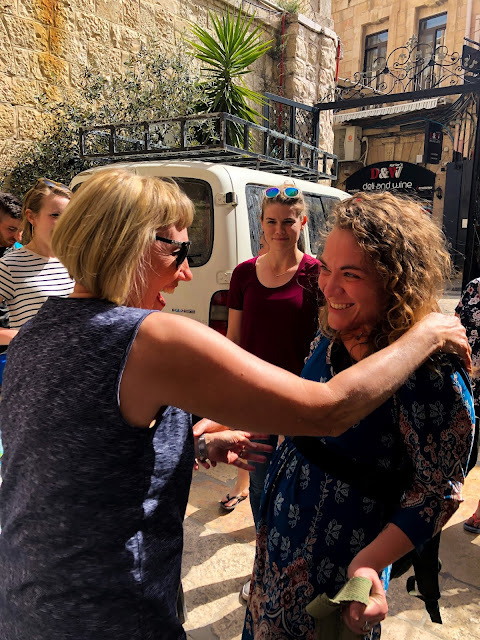 Two years ago here in Jerusalem, Katie and I literally bumped into each other at the hotel we were both staying at, reconnecting after many years of not having seen each other. 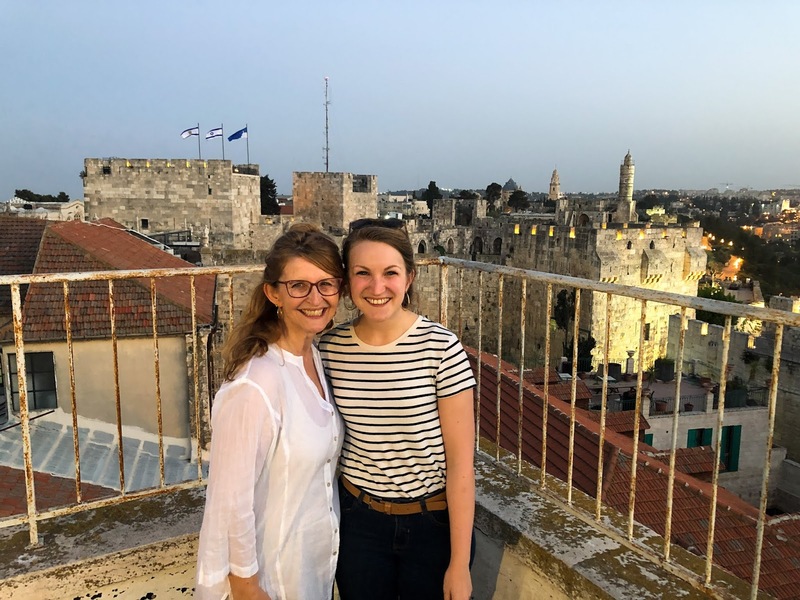 At the time she was studying for her master's at Trinity (same school as Tyler went to), and contemplating a move to Jerusalem to pursue doctoral work as well as participating in on-sight archeological digs. 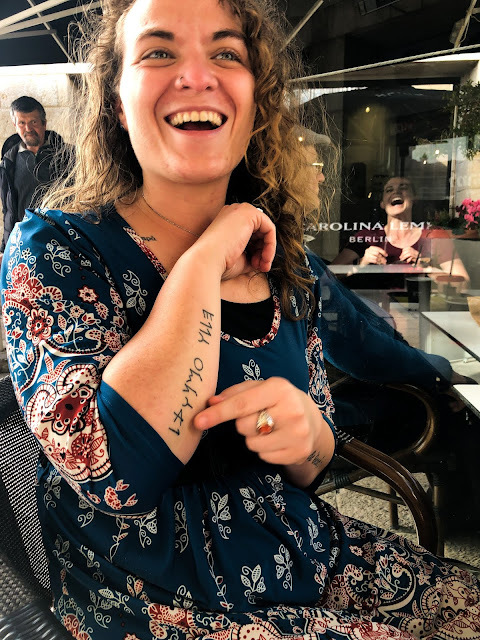 As we sat with her at coffee, she told us about her journey that led her here, and about many of the incredible adventures she's had, pursuing archeology as a career. Let me just say...this is one smart lady, who also passionately loves Jesus! What a perfect mix for an archeologist in Israel! The tattoos on her arms are all so that she has opportunities to talk about her faith when people ask what they say! Oh the joy and encouragement of getting to connect with her today! 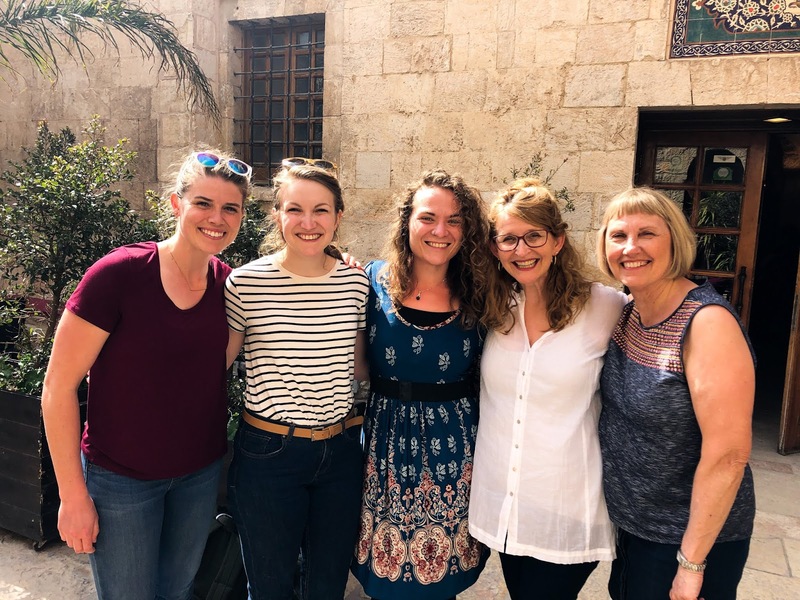 After goodbyes with Katie, we headed back to our hotel for a late afternoon gathering with the group to talk about how to live well as singles on the mission field. I am so impressed and blessed by these singles -- how I love their hearts for Jesus and desires to live well while serving Him. They face different kinds of challenges as unmarrieds, but do so with courage, faith and joy. As a mom of one of them, I can say that I'm so well pleased not only with her, but all of them for how well they're living their lives!